In a frenzied knife attack Stefan was stabbed many times by a person or persons unknown. His dying screams were heard by a fisherman at 12.05 am and at least three men were spotted running from the scene. So what was this man doing at the wharf on the stroke of midnight? As a professional astrologer if Stefan had come to see you as a client and after looking at his chart would you have seen the impending danger and what could you have told him? I became interested in murder cases back in 1988 when I started working as a funeral director and was instrumental in helping with the funeral arrangement for this man. As an astrologer it started me thinking, “for what purpose, was I born?” Some experiences in life seem to have already been scripted in the affirmative and then others appear like a cross we have to bare. With these thoughts in mind I started to take astrological profiling seriously and studied the natal chart to see what makes us tick. What signs do we need to look for that make us vulnerable to dangerous situations and more importantly what is the triggering factor? 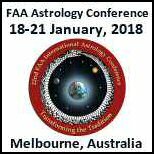 Astrology is a wonderful tool for self improvement and I was into self improvement long before I discovered astrology so the two certainly complement each other. I studied Cosmobiology, a branch of astrology first made popular by Reinhold Ebertin under Doris Greaves. This is a specialised technique that combines the art of personality profiling and predicting life’s events with considerable accuracy. The basic difference between most other systems and a chart drawn up using Cosmobiology is that most other systems use a 360 degree chart and think in terms of houses and Cosmobiology uses a 90 degree chart that places the planets into the signs of the quadruplicities (cardinal, fixed, mutable); 30 degrees are given for each quadruplicity. As with modern astrology, other charts – solar arcs, secondary progressions, transits – can be superimposed over the birth chart and from this can come fast and accurate analysis of the chart (a quad chart). Now getting back to Stefan, waiting for the family to arrive for a viewing at the funeral home, it was very hard for me to understand how this man, who looked so peaceful, could indeed have died at the hands of a frenzied knife attack. However, looking at the natal chart (birth data: 26 September 1951; Belgrade Serbia) the story is a little different. On the day Stefan was born, the Sun was in the easy going sign of Libra and the Moon and Mars in the confident sign of Leo. So here we see a man who was an idealist with a strong sense of purpose. 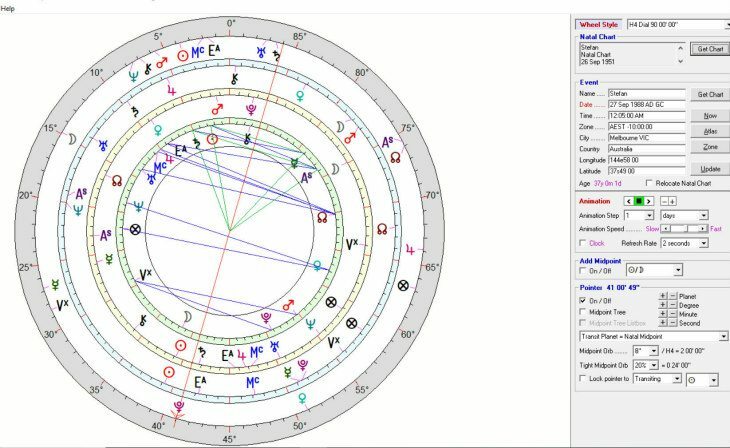 Taking a closer look to the patterns made in the natal chart on the 90 degree chart we see that Saturn is semi square (across the dial) to Pluto. This in itself can just be a hard working aspect but when in close contact with another planet then the nature of that planet has to be considered as well. In this case we have the natal Sun very close to the Saturn/Pluto which can present dangerous situations from time to time when there is no suitable outlet for it to manifest in any other way as was the case here. Also prominent in the chart is Jupiter in Aries across the dial to Mars in Leo. This is a combination that can bring successful activity and fortunate events in life, however, it can also bring rash behaviour rashness behaviour that can lead to a dangerous situation if one is not careful. Stefan was born in Belgrade in old Yugoslavia now called Serbia but the communist way of life didn’t suit him so he immigrated to Australia, married and had four children. He worked long and hard and soon he saved enough money to buy a hotel. His social life was very important to him and his Libran skills were enhanced by Leo’s lofty ideals and outward confidence so the hotel scene well and truly suited his personality. On the night in question he locked up his establishment around 11.30 pm and instead of heading home had gone down to the docks. The nights’ takings were still in his pocket and so the motive did not appear to be robbery. Today, as far as I know, it is still a mystery as to who killed him and why – there was no apparent motive and no weapon was found. But getting back to my question, if this man was your client would you have been able to warn him of the impending danger? Stefan died on the 27th September, 1988, in Melbourne at 12.05 am. Take a look at the quad chart. The inner or first circle is the natal chart. The second circle is the Solar Arc. The third circle is the progressed chart and the outer circle is the transits on the day. The first thing we see is Solar Arc Uranus to natal Pluto which is across to his natal Saturn. This aspect can indicate acts of violence or separation caused by force majeure and is triggered by the retrograde Mars on the day of death. I have put the pointer on a second Saturn/Uranus/Pluto by transits on the day of death. This pattern is made much stronger by a mid-point to Uranus/Node indicating sudden upsets or incidents in communal life. My teacher and mentor Doris Greaves always said if you see a pattern once it may pass one by with little or no action but if you see it twice then you need to pay attention and if you see it three times then it is nearly always a given. In this example we see the pattern twice which is enough to indicate this man was heading into a dangerous or life threatening situation so to narrow down the time frame I would then look at the quarterly ingress charts. In my early study of Cosmobiology Doris Greaves introduced us to the Ingress method of predicting. When one looks at the Solar Arc or draws up a Solar Return, if we see some points of interest for the year ahead we then need to be able to narrow down the point of prediction. The Ingress charts are Aries, Capricorn, Cancer and Libra are ideal for doing just that. 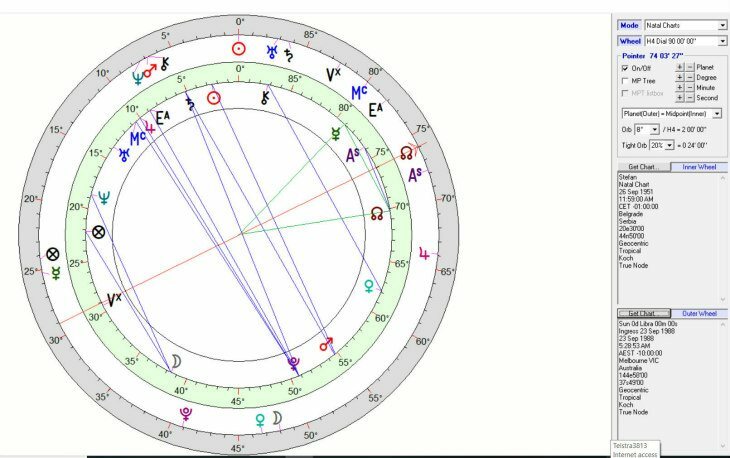 For those who are not familiar with this style of predicting the Ingress chart is drawn up for the moment the Sun moves into a cardinal sign and this chart is then compared to the birth chart. 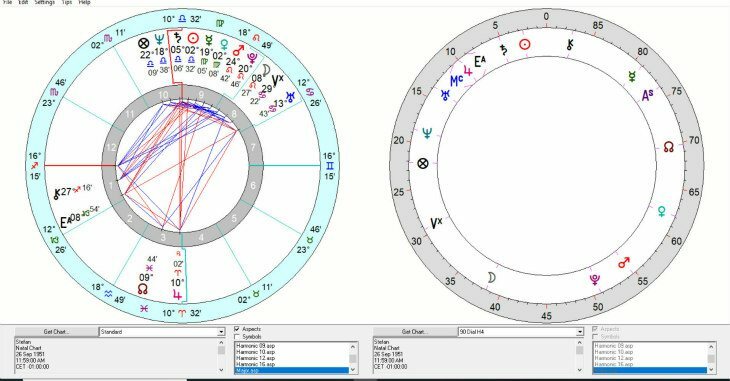 When there are connections made between planets and the natal chart then one can generally make a prediction based on the energy of those connections. That one pattern alone would be enough to advise him to be careful of his associations during this quarter. Even though this case happened thirty years ago, it still stands out in my mind. 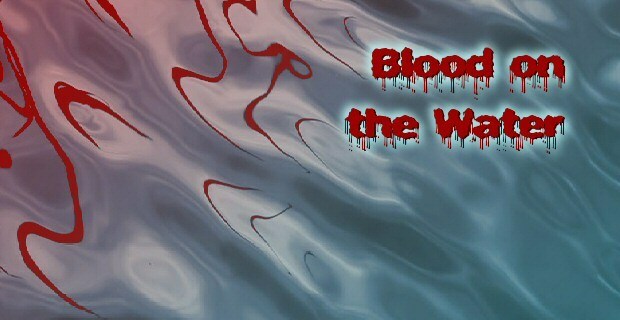 Stefan was murdered four days after the Ingress when the retrograde Mars triggered the natal Saturn/Pluto. It is a mystery as to why he was murdered. Here was a popular hotel owner with the Sun in Libra and the Moon and Mars in Leo. There are many key words that describe his personality, friendly, out-going, dramatic, romantic, and independent, but with the Mars/Neptune by Solar Arc and then again showing up on the Ingress chart it does conjures up a kind of naiveté that invites deception. There was one more pattern that needs to be highlighted and that is transiting Mercury in Libra across to natal Moon’s Node in Pisces. The Ingress Node was also mid-point to his natal Mercury/Node. We see also that the transiting Node makes some strong mid points to Mars/Sun and Saturn/Pluto indicating destructive energy and heavy demands on a person. Enough evidence here to see one’s life is in danger. Over the years I have been able to study a lot more murder charts and I have noted that with Mercury/Moon’s Node in the chart often no one is charged with the crime at the time. Recently however, we are seeing that DNA testing is solving some mysteries even up to thirty years later. Cosmobiology is a powerful tool for predicting and you may come across some confronting issues. Never be afraid of what you see as challenges are how we develop and grow. Change in all its form is a natural way of life. Sometimes it catches us off guard and we may feel our life is out of control. However, in working with any predictive techniques Neptune, the planet of deception strongly in the picture can sometimes cloud our judgement and cause the scene to become confusing and unclear. No matter how turbulent things may seem, and regardless of outer events, the moment is only temporary. And, as McBeth once said, “Time and the hour pass through the roughest day.” So; with this crime as with so many others some mysteries will always remain a mystery. Data on this case is from Glorija’s personal files. As the birth time is unknown a midday chart is used.